Amtrak Cities Sprinter locomotives, built by Siemens Rails Systems, will replace engines that have been in use for 20 to 30 years. NEWARK — When Amtrak unveils the first of 70 new locomotives Monday at a plant in California, it will mark what the national passenger railroad service hopes will be a new era of better reliability, streamlined maintenance, and increased energy efficiency. On a broader scale, the new engines could well be viewed as emblematic of the improving financial health of Amtrak, which has long depended on subsidies from an often reluctant Congress. More than 31 million passengers rode Amtrak in the 2012 fiscal year, generating a record $2.02 billion in ticket revenue. Amtrak says it will be able to pay back a $466 million federal loan for the locomotives over 25 years using net profits from the Northeast Corridor line, where ridership hit a record high last year for the ninth time in 10 years. The new engines will be used on the Northeast Corridor between Washington, D.C., and Boston and on Keystone Corridor trains that run between Philadelphia and Harrisburg, Pa. Three will be unveiled Monday before being sent out for testing. The first is due to go into service this fall, and all 70 should be in service by 2016. Amtrak awarded the contract in 2010 to Munich-based Siemens AG, which has made a big investment in the US rail industry during the past decade. The company makes about one of every three light-rail vehicles in North America and is building light-rail vehicles for Minneapolis, Houston, and San Diego at the Sacramento plant where Amtrak’s locomotives are being produced. Among the improvements in the new locomotives are computers that can diagnose problems in real time and take corrective action and a braking system capable of generating 100 percent of the energy it uses back to the electric grid — similar to the way a hybrid automobile’s motor acts as a generator when braking, said Michael Cahill, chief executive for Siemens Rail Systems. That could produce energy savings of up to $300 million over 20 years, the company estimates. They also feature crumple zones — basically cages on the front of the train that absorb the impact from a collision. The new models will be the first in North America to use them, in compliance with new safety guidelines, Cahill said. 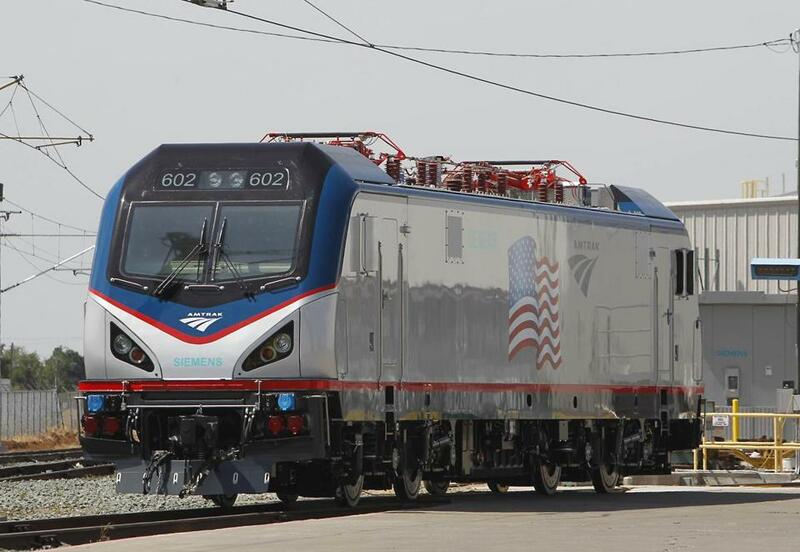 The locomotives, called Amtrak Cities Sprinters, are based on Siemens’ latest European electric locomotive and will replace Amtrak equipment that has been in service for 20 to 30 years and has logged an average of 3.5 million miles. Simply having the same type of locomotive in operation should cut costs, Amtrak spokesman Steve Kulm said. Amtrak currently uses three locomotive models, requiring slightly different maintenance, parts, and training. ‘‘Now, we will have one model, one inventory, and one training program, and all that will help efficiency,’’ Kulm said. About 750 people are employed at Siemens’ Sacramento plant. The locomotive project also involves Siemens plants in Columbus, Ohio, Richland, Miss., and Alpharetta, Ga. The ripple effect spreads farther. As a condition of the Department of Transportation loan, the majority of the products and materials used to build the locomotives must be made in the United States. As a result, some lighting parts are coming from Connecticut, the driver’s seat from Wisconsin, insulation from Indiana, electronics from Texas, and hydraulic parts from California. In all, 70 suppliers in 23 states are providing components, Siemens said. Amtrak must still seek federal funding for a long list of planned and ongoing improvements, including replacing sections of pre-World War II electrical systems on the Northeast Corridor that cause regular disruptions. The fact that Amtrak has reduced its debt by 60 percent over the last 10 years and its federal operating subsidy to 12 percent could make it an easier sell.